The Rubbermaid LunchBlox LunchBag is our best lunch box, which is fastened by a zipper closure that makes your food safe. It is covered in insulation so that your food stays fresh all the time. The handle is easy to grip while there are also many compartments for your utensils and bottle drinks. 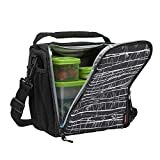 Our step-up pick is the HemingWeigh Insulated LunchBag and it is perfect for most home cooked meals and juices and it is easy to carry with a lot of zippers and compartments for you to use. The pockets make it easier to store other utensils and supplies you may need during recess or break time. The budget pick is the sujeo NEOPRENE LunchBox and it has a lot of space and it prevents leaking due to its good sealing technique plus thermal insulation to keep drinks and foods fresh. The zippers are also strong and not easy to break. The handle is well-built and the design is really smooth. A lunch box is a kind of container that kids and even adults use to pack their lunch and snacks into. 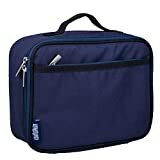 They are most likely used by kids but even office workers and construction workers will need a lunch box as well. The definitive factor for lunch boxes is the fact that it is usually square or rectangle and can fit your favorite meals, depending on the food norms in your country or area. 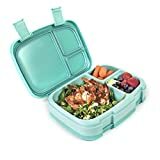 For North Americans and European countries, a lunch box can be filled with various foods for lunchtime, such as sandwiches, mashed potatoes, fruits, vegetables, meat products and the like. On Asian countries, you will most likely find a lunch box with rice meals or noodles, such as those from China, Korea or Japan, also called bento boxes. While they can contain anything, a lunch box serves generally as a food container for work or school. Because you need to have a lunch box that is food safe, most lunch boxes today are free from BPA and harsh chemicals that make it unsafe for food. Today, you will most likely find a lunch box that has a sticker that states it is free from BPA and does not contain harsh chemicals like phthalates and the like. It’s good to have a lunch box that does not contaminate your food, especially weird plastic smells that are off-putting. Most lunch boxes can have divisions such as those with sections for side dishes like fruits, utensils, sauces, soups and the like. Today, there are many choices for a lunch box and most of them can even be spill proof, which is important if you or your child will have to pack soup or catsup and similar sauces or dips. With the many designs and options, you should check which ones are safe and cleverly designed. While it is true that most lunch boxes are made of plastic material, there are special ones that are meant for far traveling, such as insulated ones, which are special and more expensive. The purpose of the insulated lunch box is to keep your food fresh and warm and to keep your drinks in the right temperature. These types of lunch boxes are mostly used by adults or those who travel cross country or going to the beach. When choosing a lunch box for your child, design can also play a factor. Whether your child loves Transformers or Barbie is a matter of personal preference, so it’s a great idea to pick designs that your child will definitely adore and be proud of. For adults, any lunch box will do, so long as it’s easy to carry and handy to unload for eating time. In the same way, a fully functional lunch box will also be durable. Type of material: most lunch boxes are made of plastic that is usually BPA free and completely sealed when you put food in. However, there are also ones made from insulated material inside which is ideal for keeping food containers fresh when you travel from place to place. A plastic lunch box is ideal for budget savers while lunch boxes with insulation are the best for going to the beach, picnics or daily commuting. Divisions or containers: a lunch box can have at least 3 to 5 containers or divisions in its entirety depending on the design that you have. In most cases, some lunch boxes have separate containers because they allow various food classifications or partitions to be packed. For instance, lunch boxes that have multiple containers can have ones for breakfast, lunch and dinner or even snack time. Divisions allow you to partition sauces and the like. Pockets: some lunch boxes also have pockets, especially those that are not made of plastic and are made with insulation material inside and synthetic fabric outside. The pockets can allow you to store extras like sauce packets, utensils and so much more. 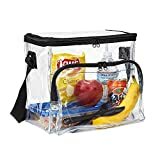 Some lunch boxes also have pockets that are specifically made for drink containers so you don’t have to worry about fitting your water bottle or container inside all the time. BPA-free: do consider a lunch box that is BPA free so that it will not affect the quality of your food. BPA is a known manufacturing substance that is chemically and artificially produced and can have bad effects for your food, so it should not be in your lunch box at all. This is especially the case if your lunch box will be used by kids, to keep them safe from its bad health effects in the long run. Shape: do consider the shape of the lunch box if it is round, square, cylinder, oval or rectangle. Some specialty lunch boxes also have heart shapes or special shapes that resemble characters or unique designs that will be a fun thing for your kids to enjoy. Color or design: the choice of color can also be a factor in deciding for a lunch box, but make sure that the paint is lead-free and that it is safe from fading and for food items. Usage: know first who will use the lunch box, whether it’s your kids, yourself, your significant other or a sibling in the family. 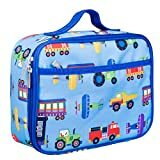 A lunch box that is meant for kids can have a fancier and brighter color while lunch boxes for teens and adults can be as simple as a synthetic fabric lunch box with plain design that comes with multipurpose pockets. Handle or strap: some lunch boxes also have straps but some are just equipped with handles. It depends on your needs whether you need to have a strap to carry it around. Water resistant: some lunch boxes are also water resistant so you can ride on your bike and not worry about getting the inner items wet under heavy rain. Spill-proof: most lunch boxes that are made of food grade plastic can also be spill-proof, which is important for those who keep sauces, soups and the like in their lunch box often. 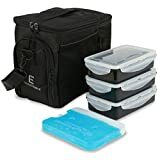 The Rubbermaid LunchBlox LunchBag is our best lunch box, which can act as both a bag and a lunch box at the same time, and is ideal for both kids and adults alike, as well as for teenagers. It has 3 colors: black, blue and pink. Completely BPA free, you can also put it in the dishwasher for easy cleaning. You can put your lunch box packs in there safely. 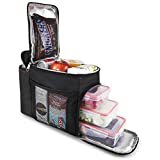 The only concern to know about the Rubbermaid LunchBlox LunchBag that is not a deal breaker is that the strap can be a little hard to adjust, but nonetheless it is a usable bag and lunch box anyway, and the strap can be replaced. Our step-up pick is the HemingWeigh Insulated LunchBag, which comes with three containers for food storage, in which all of the mare BPA free. It is fully insulated so your food stays warm and drinks stay cool and fresh. The thermal insulation is of high quality so it can be used for long picnics and vacations as well. The heavy duty bag can withstand many years of usage. The sujeo NEOPRENE LunchBox is our budget pick, which is both a bag and a lunch box, aimed mostly for adults and women due to its style. It has a tote bag style so most teenagers can take it to their high school or college recess time. You can carry your favorite food containers You can also add some fruits to munch on when you have spare time. The Wildkin Olive Kids is a BPA free bag and box that is aimed for kids and has a lot of designs to choose from, for boys and for girls. It is also PVC ad phthalate free with its fabric construction that can last for a long time. It also comes with tabs for ice packs and water bottles and a 1 year warranty. The EDC Meal PrepBag is great for portion control and comes with an ice pack as well. The top compartment is insulated so you can put other items in there. The full insulation can make it easy to retain the temperature of your food items and your drinks. The Pwrxtreme Insulated LunchBag has pockets on the side made of mesh for drinks, packets and utensils for your lunch. 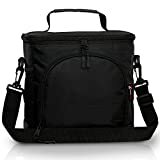 It has a two way zipper and is made of durable nylon material. The EVA material is of food grade and is FDA compliant as well. There’s also a smartphone holder in the bag. The Wildkin Whale Blue has a pocket on the front that can be zippered for putting in your utensils and the like. It is easy to clean and free from phthalates, BPA and PVC. It is of food safe material and can also be used by kids due to the variety of colors to choose from. The LunchBots Trio II is made of stainless steel material and has three divisions for a main course and two side dishes. The stainless material makes it food safe and is BPA free as well. It is environment friendly, leak resistant and can be tossed in the dishwasher. For bento style lunches, the Bentgo Fresh Aqua is a great choice, which is also BPA free and can also be used for portion control. It is spill proof and comes in other colors as well. It is easy to open and close and can be used by kids as well. 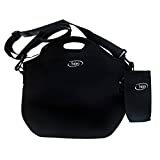 The Large Clear LunchBag has an adjustable strap so it can be used by anyone at any age. Not containing lead or BPA, it has a clear design, which allows you to see the food contents. It has a zipper pouch for keeping your items organized. It is made with food grade vinyl. The other lunch boxes were flimsy because they lacked in durability and usefulness. Most were also not BPA free so they were not of food grade and can be dangerous to your health. Some were also too small to fit in most standard lunch box items. Q: What are the benefits of using a lunch box? Lunch boxes are a great way of preparing your own meals. If kids want to have a certain kind of food for lunch and they feel sick of cafeteria food, they might ask their parents to cook or pack them their favorite lunch or snack during break time, so they will feel happier when they go back to class. You get better nutrition with a lunch box. Because you get to pack your own meal, you or your parents can decide what's best for your health. If the cafeteria mainly serves meat and carbohydrate foods, you can pack lunch that includes fruits and veggies to add more vigor and fun to your healthy diet, especially for growing children who need the right nutrition every single day. The fun bonding with classmates and friends start with lunch boxes. There's nothing like bragging your mom's home cooked meal or prepared lunch for you to your friends, or even sharing or trading lunch items with them! The fun in sharing with each other during recess time makes kids more sociable and helps enhance their thinking and social skills in the future. Not to mention, they'll make more friends if they're new to the school. You can recycle them later in life as a pencil case or holder for anything. Since lunch boxes can get old, you can use them for other things if you outgrow them. Once your child started using regular, boring lunch boxes, you can use their kiddy boxes for other household items and the like. A lunch box gives a sentimental value and personality defining value for your child as he or she grows up. It's like a best friend, more like a lunch friend to them. Whether you have a Power Rangers themed lunch box or one coated in My Little Pony designs, a lunch box can mean something for children and it's mostly the things they want! Sometimes, when you're in a hurry, you might not know what mom packed for you! Getting this thrill of surprise when you open your lunch box is part of growing up as a student and as a child. Whether your mom prepared your favorite hotdogs for lunch or whether she prepared your worst enemies (e.g. broccoli), it's always a new thing to discover every single day. Q: What is the benefit of giving the proper lunch for your child? Unhealthy foods can lead to obesity in children. Obesity is a number one problem among most children who live in areas or countries with a lot of fast food and junk foods around them. Obesity can lead to problems later in life so it should start by having children practice eating healthy lunch foods so that they can carry them over as they grow and develop. Obesity should be combated to keep your child healthy and strong against illnesses. They can develop healthy eating habits up to adulthood. As we mentioned, the more your child gets used to eating broccoli (even if they taste yucky at first), the more he or she will likely to eat more veggies later in life, reducing the risks for health problems like obesity, heart problems, cancer and the like. Good health starts in childhood so by practicing your child to eat nutritious foods, you can make their future a little brighter. Children with a healthy weight will gain more confidence in themselves. Self-esteem can sometimes start in their physical appearance, as we all know that body shaming occurs as a major type of bullying today. For kids not to lose faith in themselves and not to be teased or bullied by others, preparing a good lunch meal for them makes them less prone to obesity and other health problems, so they can live life to the fullest without being criticized badly. Some foods can feed your child with brain power. There are certain food combos that can help in memory retention, thinking skills and for examinations. Peanuts are commonly said to boost memory and can help kids to “become smarter” in quizzes. By ensuring that your child gets the right nutrition from healthy foods, they can achieve more in their academic career later on in life. Who knows – your child can become an honor student with a little nutritional push! Healthier foods can reduce the number of sick days or absences. Having a healthy diet every single day can help contribute to your child’s overall health and immune system. Citrus fruits as well as other fruits and vegetables can help keep your child strong against diseases and illnesses like coughs, colds, fever, flu and the like , so they can stay in school longer and never miss out on any activity! There's nothing like preparing a fun lunch pack for your child in your own way! Whether it’s preparing a fun looking bento box with colorful designs and characters or simply adding garnish to your child’s food, it’s a unique way of showing your love for your child when you go hands-on in preparing their lunch for them. You not only monitor their health but you also add fun to their lunch time. Q: What are some good basic food items you can put in a child's lunch box? Fruits: these are a must-have on a child's daily diet. Fruits can ward off illnesses due to their vitamin C content, which can also give your child a healthier skin and hair and less absences due to being able to easily recover from colds, flu, fever and cough. Include fruits like apple, oranges, bananas, grapes and the like. Apple has fiber for good digestion, oranges for vitamin C, bananas for potassium/energy, and grapes for hydration and vitamin C as well. Vegetables: even though your kid might not like veggies, it's still important to include them in your child's diet. You can make things fun by introducing veggies with their favorite foods such as cheese, bacon and the like to make a salad. You can also cut them into shapes to make them more attractive to the kids. You can include veggies in a salad such as lettuce, tomatoes, zucchini (or cucumber), celery, broccoli, carrots, cauliflower, radish and cabbage. Protein foods: you can include meat such as chicken, beef and some pork. Since kids love chicken, you won't have a problem with that, since chicken is the healthiest of the three meats. Eggs can be hardboiled or sunny side up. Peanut butter jelly sandwiches are also a good source of both protein and carbohydrates that your child needs for energy through the day. You can prepare chicken fried or roasted in the oven (roasted is healthier). Carbohydrate foods: you can include your child's favorite biscuits, crackers, rolls and sandwiches. For Asian countries that depend on rice and noodles, your bento box or packed lunch might be made with rice or noodles as the main course with added veggies and meat. Carbohydrates are important for energy, since your child goes through different activities throughout the day, especially if your child is into sports at a young age. Drinks: make sure your child has water in his or her lunch box. Added to water, you can also give them healthy drinks such as fruit juices (e.g. mango, lemon, orange, apple and the like). Juices are healthy and can help them get vitamin C much like from fresh fruits. You can also introduce them to yoghurt and pasteurized milk, or iced tea. Yoghurt/cultured milk can be great for a healthier digestion if your child is prone to tummy aches. Q: What types of food should I lessen or avoid placing in my child's lunch box whenever possible? Q: What is the advantage of a stainless steel lunch box compared to plastic lunch box? It is proven safer because you get less threats from carcinogenic and harsh chemicals that may harm your food because of its ill effects. These plastic lunch boxes, even though some of them claim to be BPA free, may not be completely free from these harsh chemicals so it is wiser to use steel for this case. A lunch box that is made of stainless steel can also last for a longer time due to the fact that it is durable. The stainless material makes it longer lasting compared to plastic, which can potentially break and easily get soft, brittle and crack under the sun's exposure and other elements. Even if they don't rust, plastic can be flimsier. Q: What is BPA and why does it concern lunch boxes? A: A lunch box might be made out of plastic that contains BPA, so it is good to have a BPA free seal. You should look for a BPA-free label. If you can't find one, you should at least look at the recycle code. Any plastic that has potential BPA could have a code of 3 or 7 in its recycle code. If you are not sure, you can contact the manufacturer directly or ask around for alternatives that do not contain BPA. Canned goods should also be lessened, not just because of the potential of corrosion from tin cans, but also because of BPA resin that might be lined in the can during its manufacturing process. Glass, stainless steel or porcelain can be used instead of plastic when you want to buy or use a food container such as a lunch box. Heated food will make plastic melt down and get the food contaminated by the harsh chemicals that could be in the plastic. If you cannot really avoid using plastic for budget reasons and because you cannot afford glass, stainless steel and the like, you can avoid exposing the plastic to the sun or in excess heat, which can melt the plastic and make BPA get into your food. Q: Does a "BPA free" label really make you safe from BPA? A: The BPA-free label does not always guarantee so. There are some cheap brands that may put a sticker or say that it is BPA-free when there are no certifications of testing bodies that can prove otherwise. If you are really meticulous about your child's lunch box, you can just switch to stainless steel or other alternatives with lunch box materials instead of plastic altogether. Q: Why did metal lunch box became phased out before? A: The lunch box that is made out of metal came crashing down in the market because of the expense and the price, in which plastic is cheaper to produce and easier to sell and market due to its price. 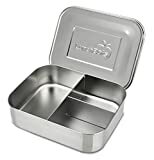 The metal lunch box was not always made of stainless steel so corrosion is a number one concern for those who live in coastal areas and highly humid countries or areas. Q: What are the potential uses of a lunch box when not being a lunch box? Q: Why should you not forget water when packing lunch? A: A good lunch, snack or dinner in a lunch box starts with water. Even if you do have juices and other liquids, nothing beats water for hydration, as it is the most basic of all hydration liquids. Without water, you or your child could possibly find it hard to swallow food or to break free from the sugars or sourness of juice. Q: What different unique foods can I put into the lunch box if my child is tired of sandwiches all the time? Q: How do I maximize my lunch preparation for my child? Start with a plan, so that you can be ready for the day or for the entire week. If you are a very busy parent or person, consider shopping with a grocery list and then planning the meals of the days of the week and the lunch box of your child. Make sure you know how to add variation for your child's lunch every single day so that your child does not get bored during recess time. When you pack ahead of time, you can avoid the morning rush. If your child doesn't necessarily need to pack lunch that needs to be cooked, such as rice or pot meals, then you can just prepare them the night before. Packing your child's lunch box as early as possible is a sacrifice that parents need to do but it will be rewarding so that your child won't be late for school. For perishable goods, prepare in the early morning. Consider re-creating leftovers because they will be useful for saving money. Leftovers can be attractive for your kids again once you redecorate them with your artistic skills. Whatever you left in the dinner table yesterday, if it is not easily perishable, you can repack that for your child's lunch box the next day to save up on your budget. Keep dessert and cold items in the freezer until it's time to pack it up in your child's lunch box. If your child wants smoothies, shakes, puddings, juices and the like, it should be properly placed in a container that won't leak and won't lose its temperature. It should be in the fridge freezer so that when you pack it the next day, by lunch time or recess, it won't easily melt. Getting your kids involved with preparing their lunch box can also be a great thing. It helps if your child can suggest on what to pack so they can involve their favorites, but make sure you pack in a delicious and nutritious meal for them and not just one food group. Your child will also feel happier if they help decorate the cookies or packed lunch with fun shapes. Learn to recycle containers, as much as possible. You can also buy cheaper containers that can be reused over and over again, such as water bottle containers and separate sauce containers so that your lunch box wont' be a mess afterwards. If you're on a really tight budget and don't want to buy containers, you can reuse some food containers that come with your food from the grocery (make sure they're cleaned properly before using). Make sure you only pack the right amount that your child can easily finish. Having a lot of food in the lunch box can make the food spoil later. Having too little food will make your child hungry, however. You should experiment to see how much food your child can finish in one recess, since some kids are slow eaters and some eat fast. Too many choices for your child can make it confusing, so include only enough food items. Q: How do I ensure my child cleans up properly after recess with their lunch box? · Tissues - for when your child needs to clean up any mess. Consider wet wipes so your child doesn't need to wet them. · Alcohol - if the school's wash area doesn't have soap, alcohol can be a great alternative to soap for washing hands. · Small Towels - for bigger messes that could occur with your child during recess time. Q: How do I pack the kitchen utensils for my child's lunch box? · You can buy or reuse an old pencil case. Some of these cases are slim enough to fit most of your child's kitchen utensils, especially with chopsticks. · You can also go for a toothbrush case, since most of them can be the same size as your child's spoon and fork. Make sure they are still food grade in material. Q: For adults with lunch box, why should I pack food that I really want to eat? It makes you less likely to give up on a healthy diet. Think about it – if you always consider choosing boring foods then you are just going to soon let go of your healthy lifestyle, which is bad. Make sure to balance veggies and yummy steaks and don’t confine yourself to juicing and bland foods all the time, just because it’s in the trend. Remember that eating only food group is also crash dieting, since you’re not getting enough nutrients. You won't feel like binge eating junk food or unhealthy food. If you keep eating nothing else but veggies, you will just increase your cravings for hamburger, fries or rice meals. By ensuring that you get a little bit of everything each day, you can slowly reduce your cravings for certain unhealthy food. Remember that fatty and carb rich foods are not your enemy – just take them slow and reduce them by and by and not in none go. Everyone has the right to eat what they want. Don’t always follow other people’s diet plans because each of us have our own different bodies. Some people need more carbs because they are thin. Some people need to reduce on sugar because they are diabetic. If you are a perfectly healthy person then there is no need to go over vegan diets if they don’t really suit your taste after you give it a try. Q: What common problems can arise when preparing your child's lunch box? · Only pack special or expensive foods when you have enough budget. · Recycle food pack containers that can still be reused. · If you have to stick to the same menu, give it a design twist each day. · Try to include foods from all food groups. · Balance salads, meat, fruits and carbohydrate rich foods. · Add fresh fruit juices. · Know the calories of foods (but don't be meticulous about it). · Ask which foods your kids don't like that much. · Add presentation, garnishing or fun art and shapes to the food. · Improve your cooking skills or try another recipe. · Add bits of your child's favorite foods on healthy stuff that they don't like. · Re-invent them for your lunch box the next day. · Add garnish or art to make them more attractive. · Don't include them if they are quick to spoil. · Make a fridge list of things to include your lunch box. · Invest in a fridge menu magnet to indicate the menu for the day. · Snacks that don't spoil can be packed before bedtime. · Wake up as early as possible to have more time to prepare things for your child. Q: What resources can I use to help me decide on my child's next lunch box meal? · Food bloggers are all over the internet and you can easily find them through Google searching the kind of foods that your child often eat on a daily basis. · They have a ton of recipes for you to choose from. · Some of your relatives may be really good with cooking or packing lunch, so get tips from them. · If you have next door neighbors who also prepare food for their kids, consider getting advice from them as well. · If you’re a traditional person, you can also consult some good old cook books your grandma must have left you behind. · Recipe sites are also diverse sources of information for food prep for your kids. · You can also get help from social media friends on deciding on your child’s next lunch box meal. Q: Should I invest in cookie cutters if I have kids? A: Yes, cookie cutters are usually not very expensive and you can use them not just for cookies, but also for other foods such as gelatin and the like. They add fun to recess time. Q: What plastic alternatives can I use for food prep? Q: Why should I let my child choose his or her lunch? A: Choosing lunch food for your child can be difficult if you don't know what your kid wants. Sometimes, you need to involve your child in deciding what to have for their lunch box by taking them with you to the grocery store. As a whole, the Rubbermaid LunchBlox LunchBag is our best lunch box due to its durability, eco-friendly design and variety of color choices. It is also easy to clean and manage.